I tested this brand new Starcraft Renegade 168 DC in northern Indiana in the heart of Amish Country. Having travelled there a few times, I was familiar with the horse-and-buggies travelling alongside vehicles on the roads. What I wasn’t prepared for was how many would be towing fishing boats, motors and all. This is a region that loves boating! 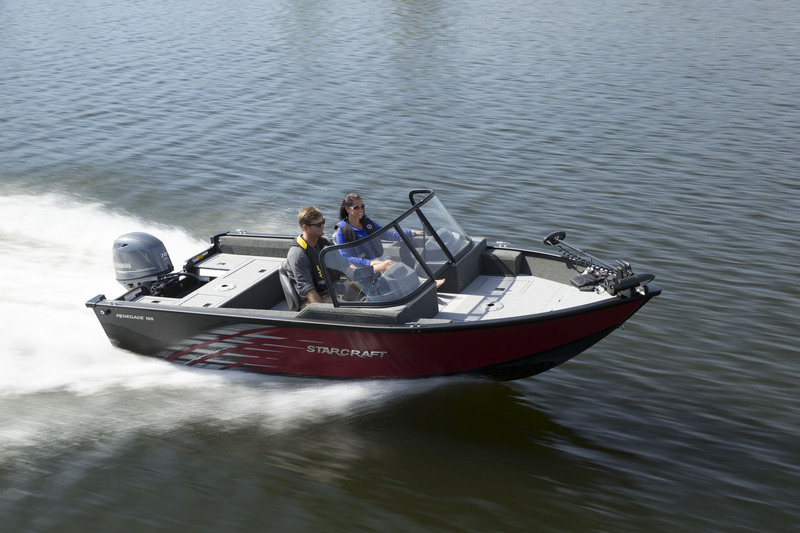 Starcraft Marine is family owned and has been on top of their game for more than a century. 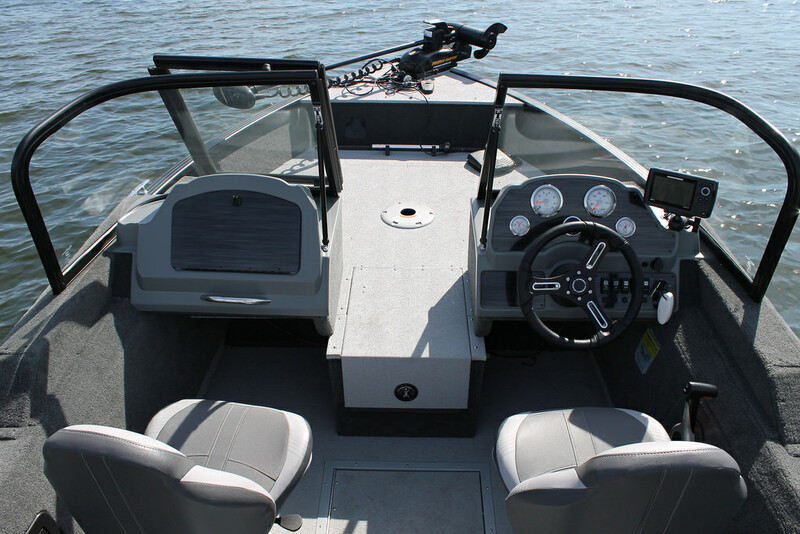 New for 2016, they introduced the Renegade 168 to their line-up of aluminum-hulled multi species fishing boats. It may be priced at entry level, but they aren’t messing about. From a pure boating perspective I was impressed. It’s under 17-feet long, not even 7-and-a-half feet wide, but it was plenty comfortable for two large men on our test day. 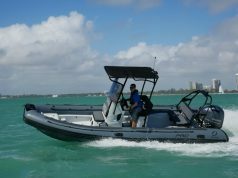 Performance, too, was impressive, running at a top speed of just over 30 miles per hour with only a 70-horsepower Yamaha. It’s rated to a max of 90-hp, but keeping the power lower keeps the price tag down. It’s nice to know you’re not sacrificing decent speed. Northern anglers will appreciate the high windscreen as well as those who go out on the water no matter the weather. The Renegade is a dry-riding hull and the windscreen keeps you sheltered. The DC stands for dual console. 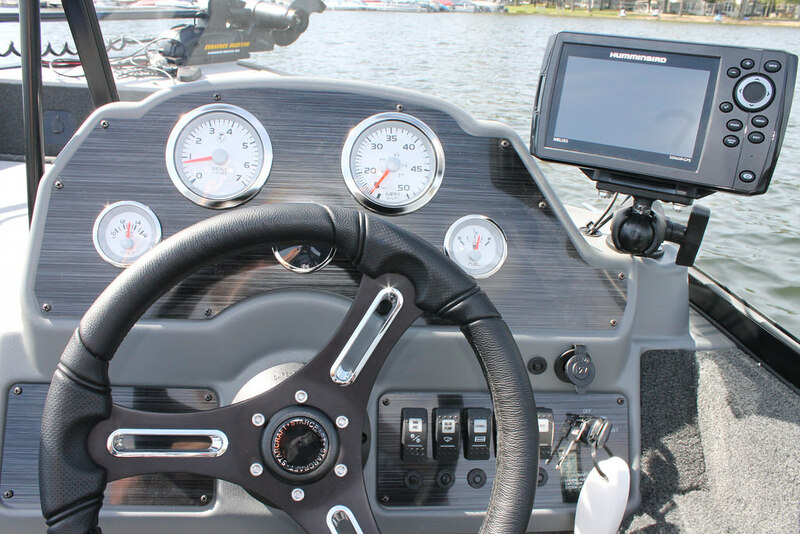 The port side has a huge glove box for phones or tackle, and at the helm there is room for ram mount fish finder/GPS units. It handles great on the water and with its compact size and weight; it is a breeze to trailer. Though, you may want more than one-horsepower to get to the lake. The Renegade 168 is the largest 16-foot boat on the market right now. It has an 89-inch beam, 16-foot-11-inch length, and 22-inch cockpit depth so you feel safe inside the boat with kids. It has a huge in-floor storage area. 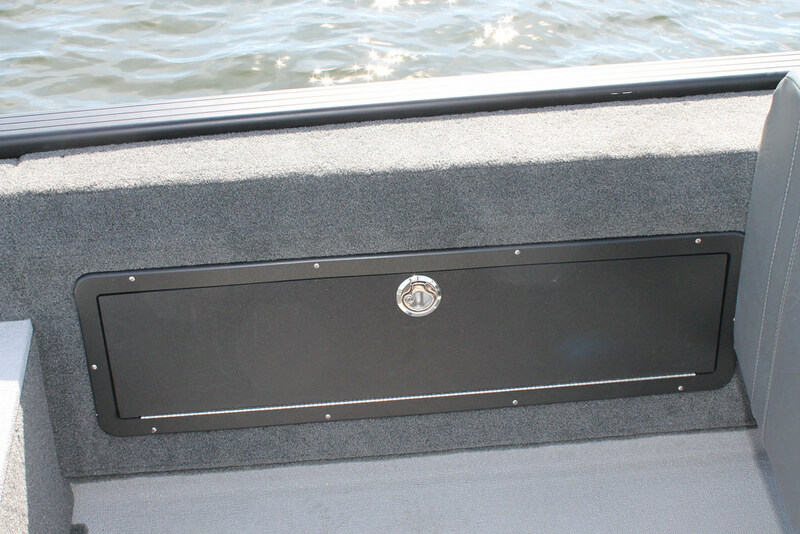 You can put dock lines, a wakeski or wakeboard, fishing rods, all kinds of things just to keep your other compartments free for tackle. On the port side is lockable rod storage, which is really nice. You can put up to 7-foot rods in there. A great feature about this boat is the large aft casting platform. It’s a huge platform. You have plenty of dry storage here, the battery and a 30-gallon livewell with built in bait bucket. It’s just a great fishing platform. At the bow there’s plenty of space to stand and cast if you’re casting for bass or muskie, whatever it may be, or vertical jigging for walleye, it’s a great universal huge bow-casting platform for a 16-foot model. 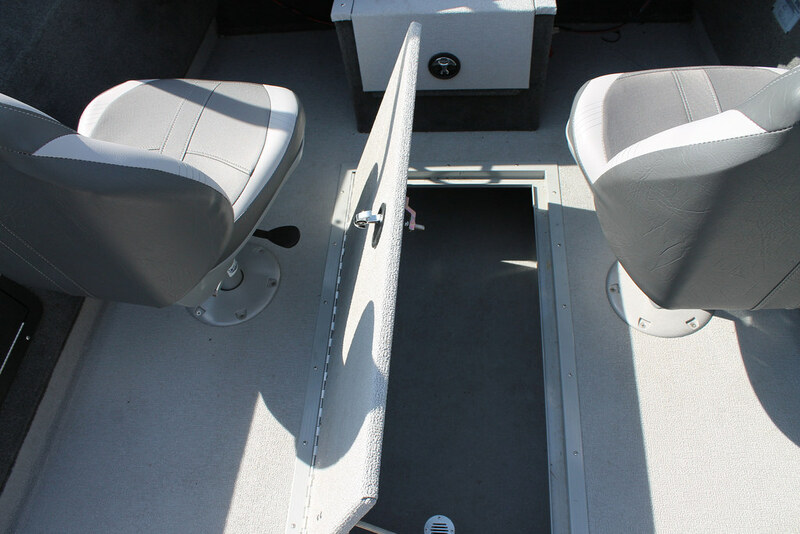 We also have a 15-gallon built-in livewell in the bow, and more storage on the starboard side. 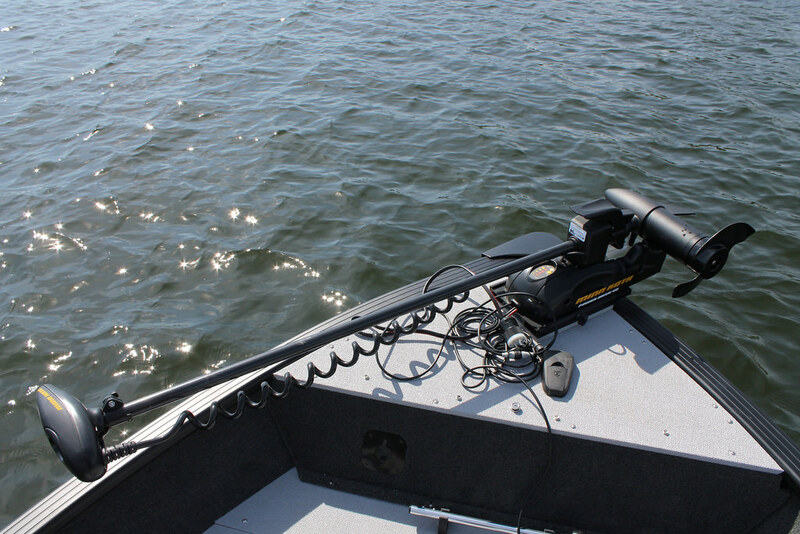 This particular boat is packaged with a bow-mount trolling motor. That makes it really nice when you’re working around areas. 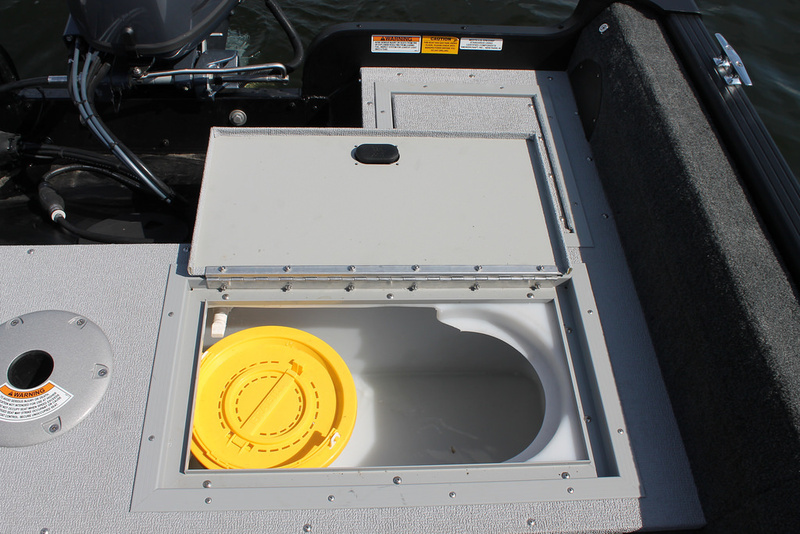 One of my favourite features on this boat is the lockable bow-centre rod storage. In addition to the port side storage, we’ve got this beautiful compartment that holds up to six rods.